Sony's NWZ-A720, A820 and A820K Walkman players all look alike, but the 8-series has added Bluetooth to sweeten the deal. It's quite similar to their NW-A829 and NW-A828 brothers that were announced in Japan, in fact. The NWA-A820 is exactly the same as the A720, but comes in a 16GB version with Bluetooth 1.3 A2Dp on board. The NWZ-A820K is also exactly the same as the A820, which includes the Bluetooth 1.3 A2DP streaming, but comes with a pair of Bluetooth headphones. However, the 820K is only available in an 8GB model. 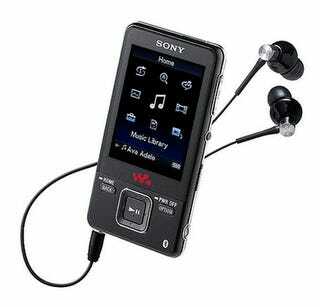 SAN DIEGO, Feb. 26, 2008 - Sony today unveiled three new Walkman® video MP3 models that for the first time in the United States support noise-canceling and Bluetooth® technologies. All three NWZ-S710F, NWZ-A720 and NWZ-A820 Walkman® players also support common audio formats, including MP3s. "Achieving the highest audio quality is one of our top priorities when designing our players," said Steve Haber, senior vice president of the Digital Imaging and Audio Division at Sony Electronics. The new Walkman® video players offer great video resolution and brightness, along with high-quality sound and an extended battery life. They come with Sony's EX series in-ear-buds with 13.5 mm drivers that passively block out ambient noise and help create a better listener experience. Sony's clear audio technologies are also included and significantly improve sound quality when playing back digital music files. They fill in the high tones that can be lost during file compression, enhance the bass, minimize distortion and maintain a consistent channel signal. The devices have a standard user interface that makes it easy to enjoy songs, videos or pictures. For exceptional image quality, the video players have a large Quarter Video Graphics Array (QVGA) LCD screen that displays video at 30 frames per second. QVGA is a display mode for small screens in which the resolution is 320 pixels vertically by 240 pixels horizontally. The battery life is up to 33 hours of music playback for NWZ-S710F models and up to 36 hours for NWZ-A720 and NWZ-A820 models. The battery life is also up to nine-and-a-half hours of video playback for the NWZ-S710F model and up to 10 hours for the NWZ-A720 and NWZ-A820 models. For business travelers or families who want to keep the volume down and the audio quality high, Sony has created the NWZ-S710F series of noise canceling Walkman® players. These Walkman® players have a built-in noise-canceling system that can reduce up to 75 percent of the ambient noise. Five clear audio technologies are built into the device to create sound clarity that maintains the same quality of the original source. Because the system diminishes intrusive noise, listeners can avoid turning up the volume. Travelers can turn on the noise canceling feature and get peace and quiet even without listening to music. The compact and lightweight NWZ-S710 players have a 1.8-inch QVGA (320 by 240 pixels) LCD screen (measured diagonally). They include an FM tuner with 30 presets that make it convenient to listen to the radio on the go. The NWZ-A720 series has a bigger 2.4-inch QVGA (320 by 240 pixels) LCD screen (measured diagonally). Incorporating the design ethos of both the previous A and S Series Walkman® players, these models have a slim body and a sleek industrial design. With the same look and feature set as the NWZ-A720 series, the NWZ-A820 and NWZ-A820K series adds Bluetooth® technology. This technology eliminates the inconvenience of wires while streaming tunes from the MP3 device to headphones or other devices with Bluetooth® technology. It also makes it easier to listen to music virtually anywhere, anytime: in the living room, bedroom, office or even outdoors. These Walkman® players have a 2.4-inch QVGA (320 by 240 pixels) LCD screen (measured diagonally). For NWZ-A820 and NWZ-A820K series, users can manually delete videos directly from the devices' internal memory without connecting to a PC. For fitness enthusiasts, the NWZ-A820K Walkman® player comes bundled with both the EX-series earbuds and the DR-BT21G Bluetooth® wireless technology enabled headphones. With a wireless behind-the-neck style, the DR-BT21G stereo Bluetooth® headset has built-in remote control features that play, pause and forward tracks. Fully charged, this headset offers hours of listening to music, watching videos or hands-free talking while connected to a compatible cell phone. These devices use Bluetooth® Stereo technology with Advanced Audio Distribution Profile (A2DP) to deliver high-quality sound. The Walkman® players support multiple digital music devices and accessories, including headphones, headsets and speakers with Bluetooth® technology. Consumers can check whether their Sony device is compatible by visiting www.sony.com/bluetoothstereo. The Walkman® players support an open platform, providing more choices for downloading and managing music and video collections online. The devices support security-enhanced Windows Media Audio (WMA), as well as non-secure AAC, linear PCM and MP3 music formats, plus JPEG files for photos, in addition to the AVC (H.264/AVC) Baseline Profile and MPEG-4 video codecs. The Walkman® video players store up to 3,800 songs on the 16GB models, 1,850 songs on the 8GB models and 925 songs on the 4GB models, for songs an average of four minutes in length at 128kbps in the MP3 format. All of the new players are compatible with most subscription music services. The new players are Certified for Windows Vista, meaning they have passed a series of compatibility tests including Plays For Sure verification. To help manage digital music libraries, the new Sony Walkman® video players come with Microsoft Windows Media Player 11. This familiar interface makes transferring music very intuitive. • The NWZ-S716F player has approximately 4GB of internal storage; comes in silver, red and black and will cost about $150. • The NWZ-S718F player has approximately 8GB of internal storage; comes in black and will cost about $200. • The NWZ-A726 player has approximately 4GB of internal storage; comes in black and pink; and costs about $150. • The NWZ-A728 player has approximately 8GB of internal storage; comes in black and pink and costs about $200. • The NWZ-A729 player has approximately 16GB of internal storage, comes in black, and costs about $300. • The NWZ-A828K comes in black, has approximately 8GB of internal storage, and costs about $270. • The NWZ-A829 comes in black has approximately 16GB of internal storage, and costs about $320. Presales have begun for the new Walkman® models online at www.sonystyle.com/walkman and at Sony Style stores. The players will be available in March across the country at military base exchanges and at authorized dealers nationwide.